With a grand inauguration on July 23, the Ignatian week ushers in a festive atmosphere to the campus. Over 15 cultural events based on the life and teachings of St Ignatius of Loyola, the founder of the Society of Jesus, are hosted by the AICUF Association of SJC every year. The AICUF curates Ignatian Week events to highlight issues like caste discrimination, gender inequality and religious intolerance. Posters and storyboards depicting the life of St Ignatius and contributions of Jesuits in the field of science and education are displayed around the college quadrangle. Movie review and extempore are the new entries to this year’s Ignatian Week festivities. “The clues for this year’s treasure hunt — one of the other competitions at the event — are themed around the teachings of the saint and the history of the Jesuits. This not only intrigues participants but also narrates his contributions in an interesting manner,” said AICUF general secretary Noel Prabhu. “Last year we started an inter Jesuit college competition for Ignatian Week in addition to the inter class competitions. 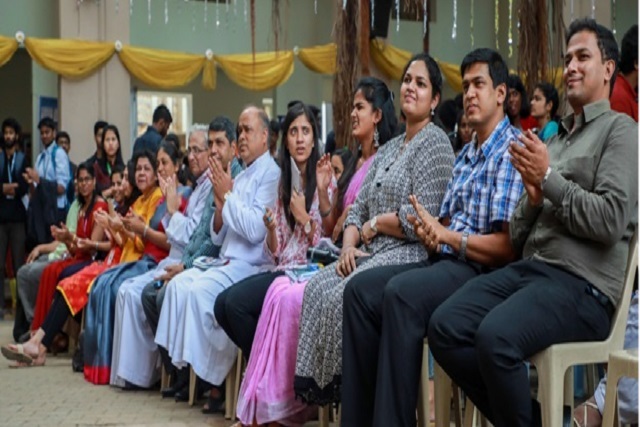 Every year we encourage a different Jesuit college in Bangalore to host it. This year it was hosted by SJCC. A new addition to this year’s Ignatian Week is that we have introduced a rolling trophy to the class that gets the most points” said AICUF president Sanjay Stephen. Noted filmmaker and cartoonist KP Sasi addressed students on various social themes like communal harmony, peace and justice on the 25th of July. The feast of St. Ignatius is celebrated on July 31. The Ignatian week will culminate with a grand mass and fellowship at our college auditorium on the 27th of July. The main celebrant will be Rt. Rev. Dr. Peter Machado, the Archbishop of Bangalore.